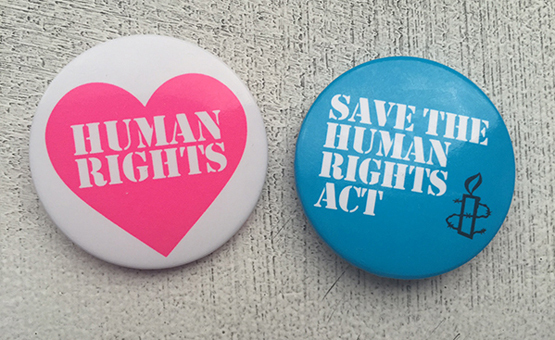 Get yourself some Save the Act stickers and badges, and show the world you stand for human rights. In a perfect world, everyone would live with dignity. But in the real world, this doesn’t always happen. Jan, who suffers from MS, was given such a low level of care from her local council that she was forced to spend all day, every day in bed. ‘It was degrading and it was inhumane’, said Jan. Thanks to the Human Rights Act, which requires local authorities to make sure their decisions don’t put people in those conditions, she was able to argue for them to increase support just enough that she could start living her life again. Hi there, I'm proud to have joined the fight to protect the Human Rights Act, and I want you to take a stand too. From protecting victims of domestic abuse, to keeping families together – the Human Rights Act helps us to fight injustice in the UK and hold those in power to account. We need to send a clear message to our next government: human rights matter. Add your voice now: http://keeptheact.uk/ Thank you, you're doing the human right thing.